From Human Transit: Yesterday I posted some data we were playing with, suggesting that Canadian cities have consistently higher transit ridership than similar US ones. Commenter Matt pointed me to his own charts on the subject, which are based on Paul Mees’s database. One of Matt’s charts makes use of citywide average density, a stat to which I’m allergic for reasons explained here and here. But here’s the other one. The y-axis here is “Journey to Work” (JTW) mode share, the percentage of commutes to work that go by transit. It’s striking how completely the three countries’ cities are sorted out. 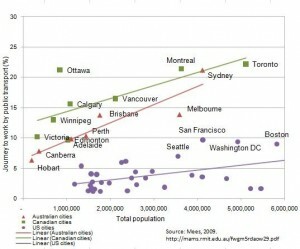 Only Edmonton lags from the Canadian pace and ends up right on the Australian trendline, while Sydney does the opposite. The concentration of employment is part of why Sydney looks so good. Sydney is Australia’s most multi-polar city, with many secondary mixed-use highrise activity centres. These centres are dense enough to have significant parking costs, and are almost always right on the rail system. The result is a multi-directional pattern of demand that’s relatively easy to serve well. 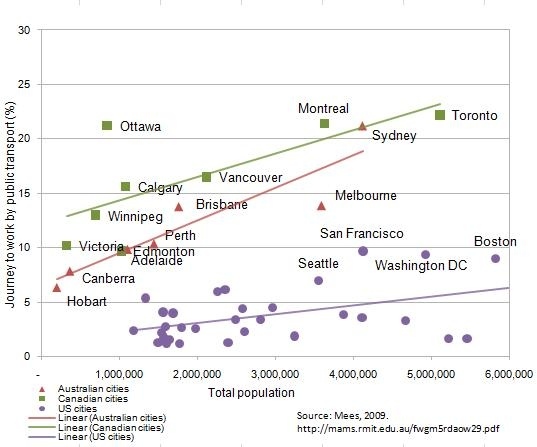 Still, Sydney’s place on this chart, surging up onto the Canadian trendline, is also a reminder of the essential role of negative incentives — sticks rather than just carrots. Sydney shows 22% of all journey-to-work trips on transit, citywide, but this is driven mostly by the massive and constrained CBD, where over 70% of all commutes are on transit. If you surveyed the riders on a crush-loaded non-air-conditioned train in midsummer, I doubt many would say that they’re on the train because it’s a wonderful service. They’re on the train because parking in the Sydney CBD can cost more than $60/day. In any case, we’re on the leadup to Canadian Thanksgiving, so I thought this little occasion for Canadian triumphalism would be apt. UPDATE: Just to clarify, the dots here represent entire metro areas, not just incorporated central cities.